While rubber prices decline and agricultural production remains unstable, the demand for agriculture land has declined as well. Srun Polet, who owns a 500 hectare rubber farm in Bor Keo District, Rattanakiri Province, said that the demand for agriculture land has declined with falling rubber prices, while other agricultural produce—most notably cassava—have become financially unstable. For example, currently rubber land is valued at $4,000 to $6,000 per hectare in Rattanakiri Province. However, three years ago, rubber land prices hovered around $8,000, while red-soil land—the most suitable for commercial crops—was priced at about $10,000 a hectare. Kim Leang, who is in the process of obtaining a social land concession in Sondon District, Kompong Thom Province, said that economic or social land concessions are currently valued between $500 to $1000 a hectare there. However, if the land has official registration from the Samdech Decho Youth Group, it could be sold for $1,500 a hectare. Cleared, unplanted land demarcated for rubber can go for $4,000 to $5,000 a hectare, whereas land where rubber sap can already be harvested is valued at approximately $15,000 a hectare. But, as rubber prices have dropped, so has the number of investors. 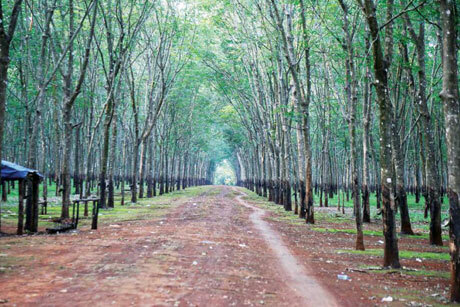 A rubber plantation in Rattanakiri: since the market price for rubber fell, its value has decreased, too. Kim also said that some rubber farmers have chopped down their rubber trees to make room for pepper trees, since the demand and value for peppercorn has steadily increased over the last two years from $11 a kilogram to $15. General Manager of Asia Real Estate, Po Eavkong, works closely with the agricultural sector. He said that the demand for agriculture land this year is lower than usual, because large investors looking to enter into agribusiness have vanished. Po added that the average cost for farmland across the Kingdom is about $3,000 to $5,000 a hectare. However, in Battambang Province—the leading rice-producing province in the Kingdom— farmland is worth as much as $10,000 a hectare, a 50 per cent decrease from 2013. Land next to national roads that can be transformed into factories, such as rice mill factories, is worth $5 to $10 per square metres, but prices dip quickly to $1 to $2 square metres when they are not adjacent to a main thoroughfare. Dr. Yang Saing Koma, CEDAC President, explained, that the demand for agriculture land is not increasing due to many reasons. The first reason is that some farmers are giving up their agriculture land because the price of rice is no longer stable. Another reason is that the workforce in the agriculture sector has decreased, as workers look for tenable employment in different industries. Meanwhile, last week, while addressing the instability of rice prices, Prime Ministry Hun Sen warned government officials to stop colluding with traders after the Ministry of Agriculture, Forestry and Fisheries announced that they would launch an investigation into an apparent price fixing scheme that forced farmers to sell their rice below-market levels. To remain competitive and financially viable, he went on to add that prices should be determined by a free and competitive market.